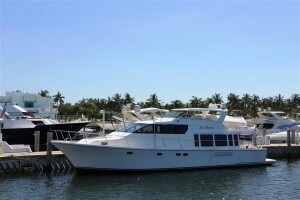 Check out these pre-owned 65' Pacific Mariner Yacht deals! : Atlantic Yacht & Ship, Inc. If you are looking for a deal on a pre-owned 65′ Pacific Mariner yacht by Westport, check out these two deals! Westport Yachts’ Pacific Mariner 65’ is the perfect size range for an owner-operator who wants to have the largest boat that is easily manageable by a couple, but small enough to be affordable for many people, both to buy and to operate. These boats exude a sense of luxury while allowing for a wide range of performance, cruising aptitudes, and applications. She was designed by two very talented west coast naval architects. Her hull was designed by a master – William Garden. Garden has been building and designing boats since about 1935 and few people alive know more about boats, both power and sail, than this giant of his craft. The exterior and interior were designed by Greg Marshall, a younger west coast Canadian designer who has many mega yachts to his credit. Pictured above is the 65′ Pacific Mariner that was launched in 2003 that is offered for sale by Andrey Shestakov named “Sea Dreams.” “Sea Dreams” is the finest 65′ Pacific Mariner on the market with extensive electronics, Multi-Sea 2000 stabilizer, and CAT engines. Significant maintenance work done on all running gear and interior upgrades including new “Fabrica” carpeting throughout. She is constantly being upgraded and has many options that are itemized in these specifications. “Sea Dreams” is in excellent condition and seriously for sale. You are encouraged to see her in person…you will not be disappointed! Pictured to the side here is a 65′ Pacific Mariner that was launched in 2005 known as “Mai Kai VII” offered for sale by Chris Carroll. “Mai Kai VII” is a one owner, well maintained vessel. She is maintained by her full time captain and is immediately ready to cruise in elegant comfort. For more information contact us today! For over 53 years Atlantic Yacht & Ship has been serving the yachting community. Our headquarter sales office is dockside at Harbour Towne Marina in the heart of the yachting capital of the world, Fort Lauderdale, FL. Our in-house waterside service department provides general yacht services from new teak, to engine rebuilds, captain services, and everything in between. Whether purchasing or marketing a quality vessel, Atlantic Yacht and Ship, Inc. is your one stop resource for the highest quality service and sales in the yachting industry today. If you are looking at yachts for sale, or thinking about selling your yacht, it is always wise to have an experienced broker representing your interests throughout the deal. Contact Atlantic Yacht & Ship at 954.921.1500 or click here. Check out this beautiful used 85′ Pacific Mariner Yacht for sale!